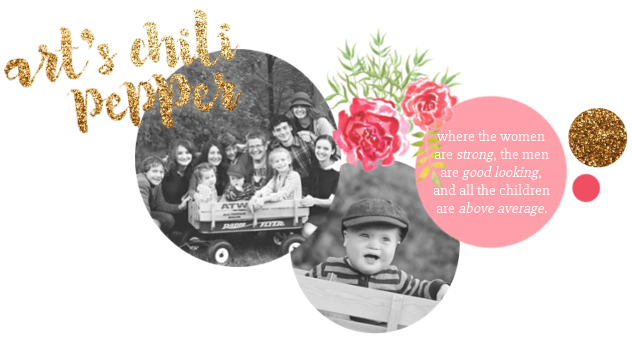 Art's Chili Pepper: Guess Who? The other day, I was looking for a photo on my computer and I came across this one. I was at a loss as to who this baby was. I looked and looked. I checked the properties for the date. The date that came up gave me no indication. I finally determined it must have been one of the many babies born in my husband's office last year. When all of a sudden something caught me eye. If you enlarge the photo, you will see down in the bottom left corner, the blue and white fabric. That brought back some memories. That was my mother's bathrobe. which, she likely still has today. And then I noticed on the right wrist the watch my mother wore everyday. It was a gold watch her mother gave her when she graduated. Which means that scrawny little baby could only be yours truly. It was most certainly taken by my dad in 1972. 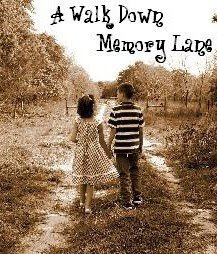 I filed it away to do a Walk Down Memory Lane post over at Erica's someday. So, here it is folks. Me in my humble beginnings. Don't you just love these pictures? Oh my goodness, what a great story! You were such a beautiful baby! Thanks for joining me on my walk today, Kat! Walks are ALWAYS more fun with good friends! So sweet. I love to see old pictures of me. Brings back so many memories of stories my parents have told. Love it. You should have saved this for your pictures of you in them, post. Can't remember what it is called but it would have been cute addition. How amazing that you discovered something new and shared it all with us. Now we have seen just where it all began. 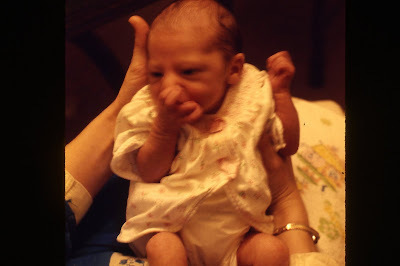 Yes, I was premature and just 5 pounds. My dad said for a long time he could fit me in the palm of his hand. But by the time I was a year old, I was so fat, the pediatrician put me on a diet. And do you know why??? I was trying to walk and I was so enormous that my thighs kept my legs from getting in the proper position to keep my balance. I will have to post that picture one of these days. And Erica, yes. I am 37 this year. My little sister was born in 73 and my brother was just above me. We were little stair steps. My parents always tell the story of having three babies in cloth diapers living in a one bedroom apartment, with no dryer. There is a picture I saw once of a clothes line strung through our apartment draped with diapers. It looked like something out of a bad episode of I Love Lucy. Boy was my mom thrilled when our house was finished and we moved to the country with a proper clothesline! What a precious photo of you! I thought you were going to say it was one of your kids, when to my surprise, it was you. We are starting school on September 1st after the bank holiday here, which is August 31. How about you? And, yes, homeschool is hard and does beat the alternative. Haha that is too funny! What a surprise that must have been; you did all that research, only to find out that baby is you! I must say, your were adorable, and are even more beautiful today! Hope you are enjoying the rest of your summer!